Aiden catching up on some sleep next to Taylor. In addition to today being a good day for Taylor as it pertains to pain control, it’s also been a good day for her and Aiden as they were able to spend some quality time together. 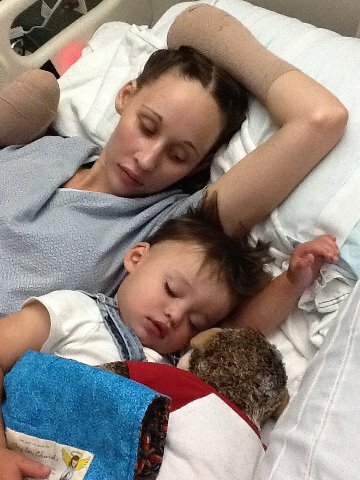 Aiden even got in a nap next to mom during his visit.I know Taylor is looking forward to more times like this, in a non-hospital setting, very soon. Monday and Tuesday were really bad days for Taylor. The doctors were having a difficult time controlling her pain. They finally figured out that one problem was that the spinal catheter and/or automated medication device was not working at all. They had to re-do the spinal catheter and were having a hard time getting it right. As a result, they had to “stick” her 6 more times before they could it reestablished. She was also hallucinating badly and as a result of being over medicated was unable to sleep. She was finally able to fall asleep around midnight Tuesday and was able to sleep all night. Taylor woke this morning with no more hallucinations!!! She is off the narcotics and is receiving a little anesthesia to keep her legs numb via the spinal catheter. Also, Channel 10 News came to the hospital this afternoon to cover Taylor and her story. They will be airing the report about Taylor tonight on the 11:00pm news. If you have a chance please tune in and check it out. The segment will be available on http://www.10news.com tomorrow sometime. Also, feel free to pass information about the news story along to anyone you may know so that we can continue to spread the word. Taylor and her family continue to be amazed by the outpouring of compassion and support by friends, both new and old, as well as by those that we’ve never even met. Your generosity has been extraordinary and it’s encouraging that in such a fast paced world, that people would stop what they’re doing to consider helping a young woman in her hour of need. Thank you for your thoughts and prayers, for your support and compassion, and for the knowledge that Taylor and family aren’t going through this alone. You’ll never know how much it means to us all. Just came out of surgery, spoke with the hand doctor she lost all the fingers and thumb on the left hand all thats left is the palm. The right hand she lost all the tips to the first knuckle to include the thumb. No issues with the surgery on her legs everything went as planned. I knew this was coming but I’m still at a loss and my heart aches for baby girl!!!! Taylor and son Aiden spending some time together on Sunday prior to the surgery to remove portions of her hands that is scheduled to take place on Monday.Taylor is undergoing another surgery tomorrow on her legs and will begin some level of amputation on her fingers/hands. Our family continues to be blessed by the incredible outpour of love and support. I know Chris and Laurie really appreciate it and feel your prayers. We will keep you posted tomorrow after surgery. I loved sharing this picture of Taylor with her adorable son Aiden. It brought her great joy to see him! Taylor’s been very emotional today as she realized that her feet were gone and then the hand specialist came in and told her that he will have to take her fingers down to the first knuckle. She’s having a pretty rough time accepting this and is saddened thinking she’ll never be able to polish her nails again among other things. My heart breaks for her but I know God has plans for her life. Please continue praying for her recovery and thank you all for getting us this far. Just wanted to update you on Taylor’s condition. 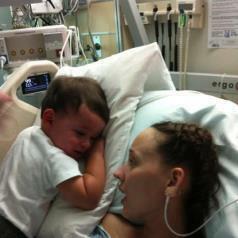 She is doing well being off the ventilator. Taylor is talking her voice is weak but how sweet it is the hear her voice!!! Very real possibility that she may come off the feeding tube today, little steps but I’ll take them!!! Again thank you so much for all the prayers and all you’ve done for all of us!!! Taylor, i do not know you personally, but I am praying for you, for Jesus Christ heals all and will give you the strength to get through the most difficult times, Taylor he hears your cries and know every tear you have shed and loves you deeply to always remain by your side. For you are a shinning angel and I know through God you will heal and will get to spend time with your precious son. I am praying for you. God Bless you and family. Taylor, my love and prayers are with you. I know what a strong young woman you are, and the spirit that is inside you. God doesn’t give us what we cannot handle. Please keep fighting and know that I love you very much! ❤ Mama C.
Taylor, I don’t know you personally either but we have a lot in common and believe me when I say that I feel your pain. I spent 7 weeks in the Palomar ICU under the care of Dr. Steele and Dr. Cloyd last year. As a result of strep “A” bacterial infection, I lost both of my legs below the knee and several of my fingertips. I know everything looks really bad right now, but it WILL get better. You’ve got a long road to recovery and it will take some time… but every day will be better than the one before. You will celebrate many victories over the coming months. Most importantly, you’re still there for a family that loves you and needs you. I wish you the best. Be strong. If I send a cashiers check, what do I put under “Pay to the order of”? all i can say is i love you, and i know your strong enough to not let this get you down. I know you will see the positive side. Ever since we were in 6th grade you always made me fell better, by just being around. There is something so very special about you something in your soul (you have the ability to light up a room with your presents), even when you have a bad day you can joke about it. I love you and want every much to hear from you when you do recover. I miss you girly, hold on to that pressious boy of your i know adien will be your strength when you dont think you have any left. your love for him will get you through. you know i dont pray much but i am now, i can honestly say im praying to god to help you in every way he can. i love you and look foward to hearing about your progress. I hope you get to read this. Stay strong, you’re gonna get through this. You’ve got an amazing support system and a LOT of people praying for you and your family. My church is praying for you. I’ll continue praying for you’re path to health and a speedy recovery. My thoughts are with you and a donation is on the way. You have always been such a sweet young lady. I knew you in high school and was good friends with your sister Megan. Hearing this story just breaks my heart; you and your family have always been amazing and sweet people and I hate that such amazing people are having to deal with this. You are a strong woman and will make a great recovery. It will be hard but stay strong that handsome son of yours needs you. Keep him in mind and push yourself to do it for him and you will do great. I wish you lots of luck and send lots of prayers. Love you. Taylor and family, Although I can’t imagine what you are dealing with right now, please know that you are in my families thoughts and prayers. Always focus on the positive and enjoy life to the fullest. I’m certain that you will adapt and learn how again. Taylor, as a mom of a young 20 year old daughter (Soon to be 21)-I am very touched by your story. You are beautiful and smiling in the cover of the picture posted that I had no idea what you had gone through this year and how much courage and strength you have. Your son is lucky to have a mom like you although does not yet understand what happened to you. He will when he is older and remember what matters is you there for him.. I am biochemistry student, I was reading about similar kind of things that happened to you.